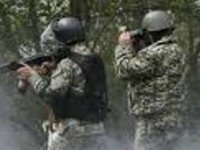 One Joint Forces serviceman was wounded as a result of shelling by illegal armed groups in eastern Ukraine on Friday, the press center of the headquarters of the Joint Forces Operation (JFO) has reported. "Today, from 07.00 to 18.00, Russian occupation forces violated the ceasefire 14 times [...] One Joint Forces serviceman was wounded in fighting," the JFO HQ said on its Facebook page. According to the report, militants did not use heavy weapons on Friday. "The invaders opened fire from grenade launchers, heavy machine guns and small arms at the positions of the Joint Forces outside settlements of Krymske, Novozvanivka, Krasnohorivka, Chermalyk, Pavlopil, Vodiane, Lebedynske and Shyrokyne," the report says.